If the device is located outside of the 4G Mobile Broadband Coverage Area reverts to a 3G Mobile Broadband connection, if available. When connected to 3G Mobile Broadband, the device does not experience the same speed or throughput as 4G Mobile Broadband. From the status bar (lower left), verify the available network listed e.g., Mobile Broadband (4G LTE). To view available Verizon Wireless networks, hover the mouse cursor over the signal indicator in the status bar. From the Minimum view, hover the mouse cursor over the signal bars. 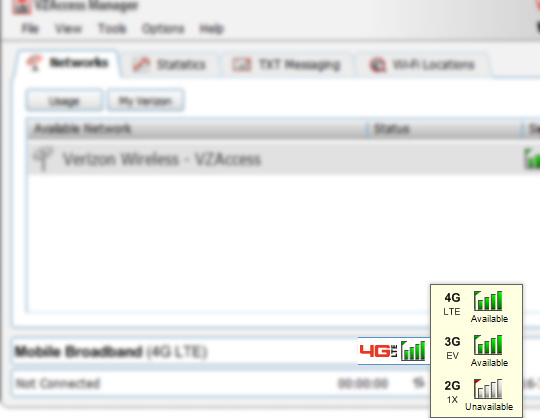 From the VZAccess Manager main screen, locate the signal strength indicator (to the right of the available networks). If the device is experiencing low or no signal strength, ensure the antenna is fully extended and perpendicular to the computer. If signal strength doesn't improve, move the device to a location where it receives a stronger signal.